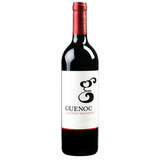 Guenoc Lake County Cabernet Sauvignon hails from the Tephra Ridge Vineyard and has fruit-forward aromas of red cherry and currant. Guenoc Lake County Cabernet Sauvignon hails from the Tephra Ridge Vineyard and has fruit-forward aromas of red cherry and currant. This wine is full-bodied with complex flavors of toasted oak, and cigar box that complement the fruit-forward flavors for an exceptionally long finish.